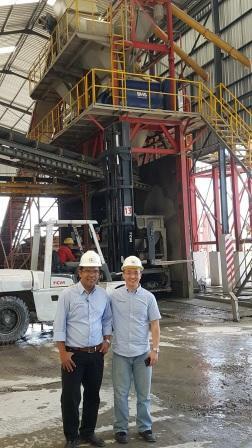 BHS-Sonthofen – based in Sonthofen, Germany – has in a repeat order supplied two twin-shaft batch mixers to PT Calvary Abadi, a player in Indonesia’s precast concrete industry. This clearly demonstrates that twin-shaft batch mixers are suitable for use with precast concrete, contrary to popular opinion. As an exclusive Indonesian cooperation and sales partner, PT Detede is authorised to promote and sell BHS-Sonthofen products. The company produces complete concrete and asphalt mixing systems; BHS supplies the high-quality mixers required for concrete manufacturing. In March 2017 PT Calvary Abadi, the market leader for precast concrete in East Java/Surabaya, explicitly requested a BHS-Sonthofen twin-shaft batch mixer from Detede – a rather unconventional choice for precast concrete.